/ Headlines / Finance News / Why Is the US Dollar Rising? 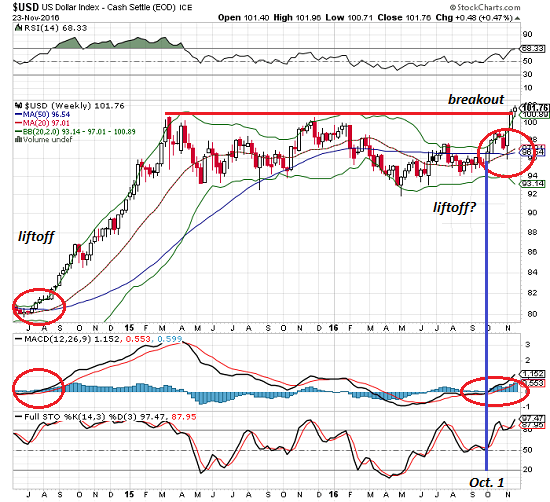 On October 3rd I asked Is the U.S. Dollar Set to Soar? It seems the answer was yes. This raises a further question–why shouldn’t the USD rise another 20%? Longtime readers are all too familiar with my many essays on the US dollar over the past four years, and so they shouldn’t be surprised that the USD is moving higher. While I have great respect for the analytic skills of the many dollar bears who have expected the USD to decline or collapse, we all have to respect the market’s movement. In the case of currencies (which trade in the trillions of dollars daily), it’s difficult to make a persuasive case that currency trends are driven by central bank interventions. Policies such as interest rates and bond-buying, yes–intervention, not likely. The currency markets trade the entire Federal Reserve balance sheet–roughly $4 trillion–every two days. 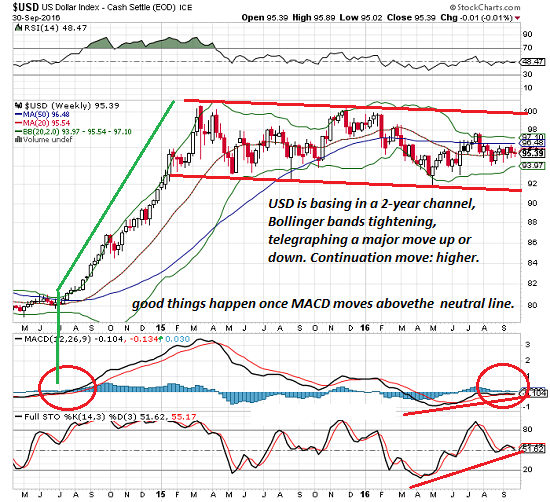 So we have to look beyond manipulation for explanations of the USD’s uptrend. The conventional view–which I have shared–is that the trend toward higher yields in the U.S. acts as a magnet for capital in a zero or negative-yield global economy. While these explanations make sense, they don’t tell the whole story. Let’s start with the foundation of currency supply and demand: capital flows. Now compare the ease of moving electronic money around the world. A few clicks and a few seconds are all that’s needed. The story of the financialization and globalization of the planet’s economy is ultimately a story of easing the flow of capital. The neoliberal philosophy places a premium on easing capital flows in and out of any market, and turning every corner of the world into a market that is accessible to mobile capital. The big money being made in China is financial, not industrial. This story is repeated everywhere that capital has mobility. In emerging markets, hot money flooded in when the USD was in a downtrend, inflating bubbles in local real estate, stock markets and commodities as finance capital reaped the profits from rising emerging market currencies. When the USD trend reversed, mobile capital cashed out and left the emerging markets in a digital flood tide. The mobile-capital driven bubbles in currencies, stocks, real estate and commodities all deflated, devastating markets and the social structures that depend on markets’ expansion. The global rise of populism is raising doubts about the stability of a status quo that has greatly enriched the few at the expense of the many. This rising wealth/income inequality is the result of mobile capital’s ascendance to supremacy in profitability and political influence.